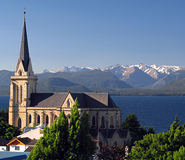 Discover Bariloche during your fully customizable Argentina vacation. All of our Argentina tours have daily departures and are covered by our price guarantee. With a stunning landscape of rocky crags and dense woods as a backdrop, the lakeside town of San Carlos de Bariloche (commonly just called Bariloche) is the ideal location to enjoy Patagonia’s rugged natural beauty. Sitting at the foothills of the Andes, which loom to the west, and with the plains of the Patagonian steppe to the east, and the vast Nahuel Huapi Lake right in the center, Bariloche is a dream vacation spot for adventure travelers. Here, outdoor enthusiasts can enjoy trekking, skiing, various water sports, and climbing, among other thrilling activities on their Bariloche tour. Bariloche is located right in the center of Nahuel National Park, which gives nature lovers the chance to get up close and personal with the distinct wildlife in the park, including birds such as parakeets and condors. Mixed among the natural beauty are many traveler-friendly facilities, such as quaint boutiques, famous chocolate shops, and first-class restaurants offering some of the best foods in Patagonia. City Tour. One of the most popular things to do in town is to take a city tour. Just a few blocks from the Civic Center sits perhaps the most strikingly positioned church, named Nuestra Señora del Nahuel Huapi Cathedral. Perched on a hilltop and surrounded by imposing pines under a brilliant blue sky, this church is simply stunning and has recently been declared a National Historic Monument. Visit Museums. Within the attractive, Swiss-inspired Civic Center sits the must-see Museum of Patagonia, the perfect place to learn about the indigenous inhabitants of Bariloche and its surrounding area. If natural history is more to your taste, then do not miss the Paleontology Museum, located right on the coast of the beautiful Nahuel Huapi Lake and displaying a wonderful collection of deposits from millions of years ago, including a 22-million-year-old shark jaw. Hiking and outdoor adventures. 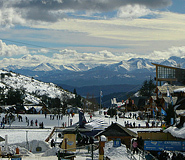 Many of the attractions of Bariloche are located outside the city’s center. The biggest appeal of Bariloche is that it offers wonderful opportunities to enjoy the brilliant Argentine alpine wilderness. The water line route of the Circuito Chico (Small Circuit) offers amazing views of the merging Nahuel Huapi and Perito Moreno lakes, as well as of the snow-capped Cerro Catedral peak. 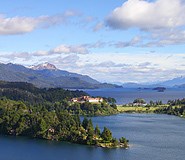 The vast Nahuel Huapi National Park, within which lays the famed Arrayane Forest, beckons vacationers who enthusiastically roam the numerous trails to observe wildlife. Renowned for its first-rate skiing, Cerro Catedral is the largest resort of its kind in South America, but travelers will also find countless fishing, mountain biking, rafting, and swimming opportunities. Bariloche is famous for being an exquisite winter holiday destination. Full of chocolate shops, microbreweries, and world-class skiing, Argentina’s winter is spectacular in Bariloche. However, if you’re looking to avoid the packs of holidaymakers during peak season (December-January and July), consider visiting Bariloche in the spring (September-November) or autumn (March-April) when the surrounding forests are at their best, and the crowds are smaller. On the other hand, if you are interested in skiing down the slopes of Cerro Catedral, August is the perfect month. We just got back to Paris this morning and the return trip went well. All in all, our trip was great. Our heads are filled with beautiful images and we are very satisfied with your work all throughout our trip. We have traveled all around the world but this trip to Argentina was our first in Latin America. We will make sure to contact you for another trip soon. Argentina was so beautiful and diverse, and Argentina For Less was definitely a good choice for us. You were able to meet our needs and help us find an efficient way to move around the country, and provide us with suggestions for tours and accommodations. And we still had time to explore on our own. Thanks for this well organized trip to Argentina. It was so great. All the guides were on time and interesting, and all the hotels were comfortable. Once again you did a very good job. The internationally renowned Llao Llao Hotel & Resort is one of the finest hotels in Latin America, as much for its magnificent location as for its sumptuous, elegant interiors and refined service. Situated on the Llao Llao Peninsula, the hotel was built in 1938, and features 159 comfortable and tastefully decorated rooms. The spa offers views that are nothing less than panoramic, with treatment rooms affording breathtaking lake and mountain vistas. The hotel's exquisite restaurant, Los Cesares, is the best in the Bariloche area, and the business center has free Internet access available for registered guests. Among the facilities of this luxurious accommodation you will find a heated swimming pool, bar, lounge, golf course, tennis courts, gym, spa, children's center, and shopping arcade, to name only a few. Patagonian-chic is what you'll find at the Design Suites Hotel in Bariloche. Although the interiors and exteriors of the hotel are made up of local woods and stones, there's nothing rustic about this exceptionally modern lodging. All 60 suites have floor-to-ceiling windows which provide breathtaking views of Lago Nahuel Huapi. Spacious and comfortable, the suites offer internet access, a fully-equipped kitchenette and a flat-screen TV, among other amenities. The hotel itself boasts an on-site gym, heated swimming pool for dipping during the winter and an art gallery. Located on a residential street, away from the hustle and bustle of the city center, the View Boutique Hotel provides tranquility within a busy and dynamic town. The building sits atop a slight hill, therefore all 12 fully-furnished suites are dotted with a beautiful view of Lago Argentino. Rooms are decorated in a minimalist and contemporary style yet are extremely comfortable and well-appointed with cable TV, a queen-size bed with crisp linens, and ample lighting which all provide the utmost convenience. A delicious continental breakfast of toast, croissants, marmalades and coffee is available to guests and a welcoming common area with a fireplace is a good place to warm up after a long day of Patagonian sight-seeing.